Presidential budgets are policy statements, frequently ignored by Congress, and this one is no different (It has already been declared a "nonstarter" by Democrats.) So in a way, this is Ivanka Trump and the White House signaling that they want in on a debate already underway in the business world and in politics about this "ever growing challenge." "You have care providers who are working at below poverty wages, you have parents who can't afford the care and you don't have a robust ecosystem of facilities because it's a low-margin business with high liability," said Ivanka Trump on the sidelines of a discussion she recently led at the White House with about more than a dozen people who specialize in child care. "So, it's like just a fundamentally flawed system." NPR was invited to the West Wing listening session in late February and was given early details of the child care proposal from Ivanka Trump that is included in the president's 2020 budget. The centerpiece is a proposed one-time investment of $1 billion to increase the supply of child care to underserved populations. States would apply for funding and could use it to encourage employers large and small to invest in child care or to support child care providers that operate during nontraditional work hours or that cater to parents who are enrolled in school. "We want to encourage innovation," said Ivanka Trump. "We want to encourage the private sector to step up." To get the money, states would have to "establish targets for reducing unnecessary regulatory or other requirements that limit the supply or increase the cost of child care." A White House aide said this isn't meant to roll back regulations on child-to-caregiver ratios but rather to get rid of zoning requirements in some areas that don't allow child care centers in residential districts, for instance. It would be implemented through the Child Care and Development Block Grant program, which in the past two years saw its funding significantly boosted by Congress in spending bills ultimately signed by President Trump. A White House official, who declined to speak on the record because the budget is not yet public, said the president's 2020 budget proposal calls for spending $5.3 billion on the program, the same level that Congress set aside in 2019 and a big increase over what past Trump administration budgets asked for. The $1 billion one-time fund would come on top of that. Ivanka Trump said, "Continuing to make sure we fund the programs adequately" is key, while also talking up the increase in the child tax credit included in the Republican tax law passed in late 2017. Trump greeted the researchers, child care providers and representatives of business groups in the Roosevelt Room before going around the table asking about challenges and soliciting ideas for solutions. She chimed in occasionally to amplify someone's point or to ask questions. Here are some of the challenges that Trump and the experts she met with identified in that White House meeting: The early years are critical for brain development but quality, safe, affordable child care is often hard to come by. There are mile-long waiting lists for care that, for many families, costs more than their housing. And yet, a lot of child care workers can't make ends meet. As Trump talked about the challenges, she framed it in a way that Democrats have for years — not as a "mom's problem" or a "families' problem" but as an impediment to economic growth. Chad Dunkley, CEO of New Horizon Academy, a child care provider, attended the listening session and has advocated for more child care funding on Capitol Hill. "I think there's a growing bipartisan consensus that we have to do more to build the financial security of young families in this country," said Dunkley. "They have to feel confident they can grow their families here, and if they don't, our economy is going to be in trouble." That economic strain is already evident in low birthrates and stalled labor force participation, Dunkley said. The White House was asked about proposed funding levels in the 2020 budget for Head Start, another major early childhood program, but that information was not forthcoming. President Trump included child care in his 2016 campaign, and as his re-election efforts ramp up, the White House has put a focus on selling the idea that he has kept his campaign promises. That said, this new proposal isn't remotely close to what Trump campaigned on. It comes as child care is already a 2020 campaign issue, with Democratic candidates, including Elizabeth Warren, rolling out child care-for-all plans. "How much you make at your job should not determine the quality of care your child gets. That's why for millions of families who need it, access to these child care options will be free," Warren said in a video announcing her plan. In Congress there are child care bills from Democrats in both the House and the Senate designed to stimulate growth in child care availability, defray costs for families that can't afford it and pay providers a living wage. The price tags on these plans run tens of billions of dollars each year, vastly more than the White House proposal. The White House official said these Democratic plans would cost "unsustainable amounts of taxpayer dollars," adding that Ivanka Trump sees her role as "an advocate for producing legislation that actually has a viable path forward." Asked if she could work with Ivanka Trump on child care, Sen. Patty Murray from Washington state, a leading Democrat on the issue, was polite. "I'm excited that more people are aware of the barrier that child care is to working families in order to achieve their economic dreams and take care of their families," said Murray. "So we welcome all ideas, but they have to be real ideas." There's plenty of agreement on the problems but not yet on the solutions. Asked which members of Congress the Trump administration had reached out to on the issue, the White House official said simply that Ivanka Trump looks forward to working with lawmakers from both sides of the aisle. Back to this country now - the federal budget President Trump proposes today includes a line for child care. The proposal to increase funding is a priority of the president's daughter and adviser Ivanka Trump. Here's NPR White House correspondent Tamara Keith. IVANKA TRUMP: How's everyone doing? TRUMP: Good. Well, thank you all for being here. 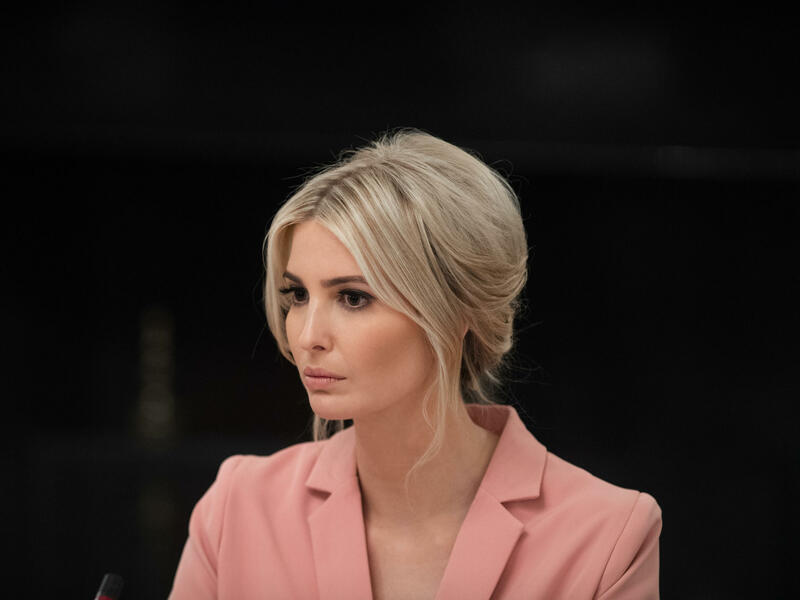 TAMARA KEITH, BYLINE: On a recent afternoon, Ivanka Trump led a discussion in the White House with more than a dozen people who specialize in child care. KEITH: NPR was invited to the listening session and given early details of a child care proposal from a Ivanka Trump included in the president's 2020 budget. The centerpiece is a one-time investment of $1 billion to increase the supply of child care. States would apply for funding and could use it to encourage employers, large and small, to invest in child care or to support child care providers that operate during nontraditional work hours. To get the money, states would have to cut regulations that limit supply or increase cost. TRUMP: We are doing a lot. But it's not perfect still. KEITH: Here are some of the challenges that Trump and the experts she met with identified in that White House meeting. The early years are critical for brain development, but quality, safe, affordable child care is often hard to come by. There are mile-long waitlists for care that, for many families, costs more than their housing. And yet, a lot of child care workers can't make ends meet. Trump described it as a market failure. TRUMP: The system's just broken. And we're trying to intervene and fix it in every way we can. KEITH: As Trump talked about the challenges, she framed it in a way Democrats have for years - not as a mom's problem or a family's problem but as an impediment to economic growth. Chad Dunkley is CEO of New Horizon Academy, a child care provider. He attended the listening session and has advocated for more child care funding on Capitol Hill. CHAD DUNKLEY: I think there's a growing bipartisan consensus that we have to do more to build the financial security of young families in this country. They have to feel confident they can grow their families here. And if they don't, our economy is going to be in trouble. KEITH: He says you can already see the strain in low birth rates and stalled labor force participation. Presidential budget proposals are policy statements frequently ignored by Congress. So in a way, this is Ivanka Trump and the White House signaling they want to be part of a larger conversation that's happening in the business world and in politics. The new White House proposal comes as child care is already a 2020 campaign issue, with Democratic candidates - including Elizabeth Warren - rolling out child-care-for-all plans. ELIZABETH WARREN: That's why, for millions of families who need it, access to these child care options will be free. KEITH: And in Congress, there are multiple child care bills from Democrats. The price tag on these plans runs tens of billions of dollars each year, vastly more than the White House proposal. A White House official described the Democratic plans as unsustainably expensive and said Ivanka Trump sees her role as an advocate for producing legislation that actually has a viable path forward. Senator Patty Murray from Washington state, a leading Democrat on this issue, was polite when asked if she could work with Ivanka Trump on this. PATTY MURRAY: If it's real and it isn't just a Band-Aid and it actually does provide real child care for folks who need it. KEITH: There's lots of agreement on the problems. Solutions - not yet. Tamara Keith, NPR News, the White House. (SOUNDBITE OF MAN MOUNTAIN'S "TO BE MADE AS NEW") Transcript provided by NPR, Copyright NPR.